explore mt. hood national forest every second sunday! Will Governor Kate Brown, sworn in yesterday, allow the State-Nestlé partnership to continue? Or worse, will Governor Brown allow the Dept. of Fish and Wildlife to apply for a "water rights cross transfer" and fast-track the giveaway of our water to Nestlé? Click for explanation of "cross transfer" versus "exchange." We are cautiously optimistic that Governor Brown will protect our public water resources but we don't actually know--that's why we need to act now. 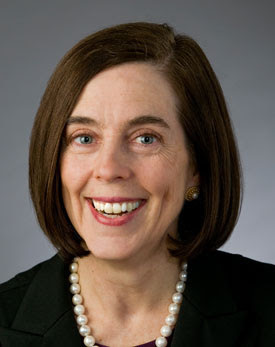 Please welcome Governor Kate Brown to her new post and remind her that you oppose Oregon Department of Fish and Wildlife facilitating a proposed Nestlé water-bottling plant in the Columbia River Gorge. Help us add organizations/businesses to a sign-on letter opposing the proposal. This letter to ODFW, cc'd to Governor Brown, is needed to demonstrate that this is an issue that all Oregonians care about. Simply visit the Keep Nestlé Out of the Gorge website and click on the "Sign your organization..." underneath the Take Action header. On Tuesday, Bark and our allies at Food and Water Watch and Crag Law Center met with the Oregon Department of Fish and Wildlife to discuss its current transfer and exchange applications. When we asked them about this new proposed "water rights cross-transfer," they stated that they are looking into it and that they will check in with the Governor's office before proceeding. Governor Brown is new to this issue, so our action page provides a template that assumes she does not want to set a precedent by allowing State-facilitated water bottling. But let's not leave anything to chance. Please, take action today to welcome Governor Kate Brown with a pro-water message. PS- Every day I work with inspiring Barkers: staff, board members, and other volunteers. But this week has been thoroughly humbling. 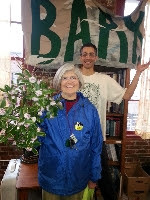 In response to last week's "wish list" email, not only did we fill the office with the heavenly smell of daphne (I was writing this PS when Theodora, pictured right, brought in our latest daphne donation), but we also received laptop computers, rain gear, pens, flip charts, monitors, tea, tea, and more tea. My favorite part? These items went from collecting dust at someone's house or office to helping Bark protect Mt. Hood National Forest! Thank you thank you thank you! Thanks to Gary Braasch, Timothy Solar, and Christine Toth for use of the photographs.